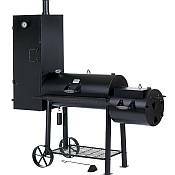 The Medina River Big Daddy Double Bar B Q Smoker is a double smoker/grill combo made of #1 quality 14 gauge steel. The combo features two smoking chambers and a fire box. Each smoking chamber has easy access tight-fitting doors for positive air control. The horizontal and vertical smoking chambers have thermometers and drip buckets. 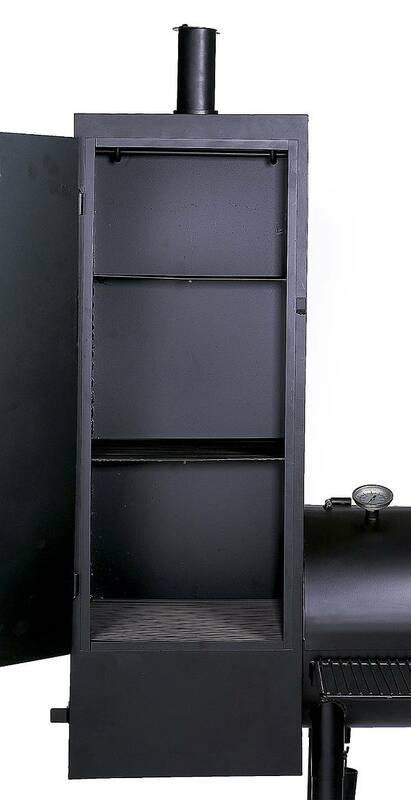 The vertical smoking chamber features three 16" x 16" shelves and a hanging bar for meats. The vertical smoking chamber also has an additional side door to aid in air (temperature) control. With this combo, you get a smoker and a grill all in one. There is no need to purchase a grill and a smoker. It is ideal for the backyard or pool area. The fire box is designed to use either charcoal briquettes or lump charcoal. A preparation tray runs the length of the horizontal smoking chamber. Also, for positive air control, there is a baffle that closes 100% and an internal banding on the ash door. The ash door is oversized and swings out 180 degrees for easy clean out. 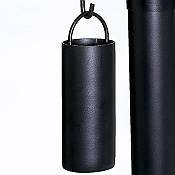 The exhaust stack features an easy-to-adjust damper flute. The cooking temperature is so easy to control and maintain on this smoker/grill combo! 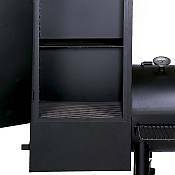 The Medina River Big Daddy Double Bar B Q Smoker is great if you need both a smoker and grill that can also be easily moved. It comes with two strong 10" steel wheels for rolling with ease. The large lower shelf is sturdy and is great for storage. 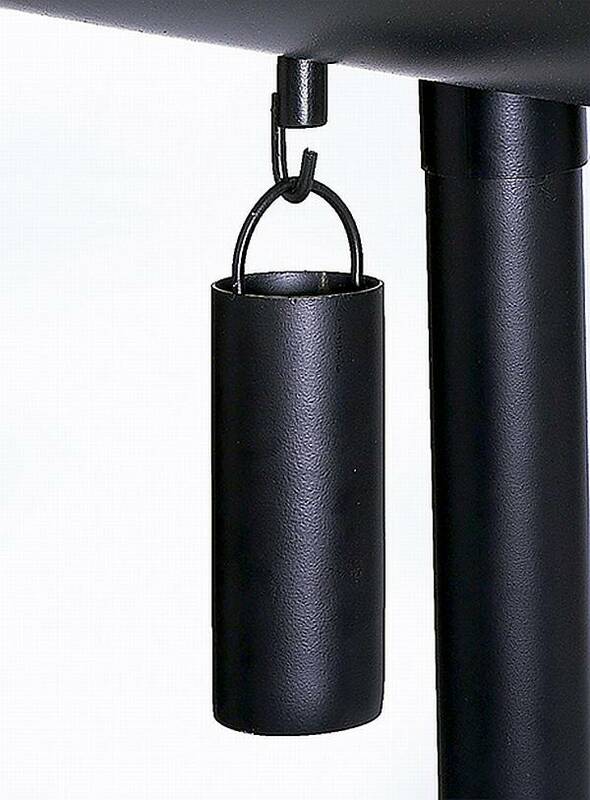 The "cool to the touch handles" on the smoking chambers prevent burns. Both the vertical and horizontal smoking chambers have grease drain holes and grease bucket hooks. A large, easy to read thermometer with a 3" dial, an ash rake, and two drip buckets are all included. 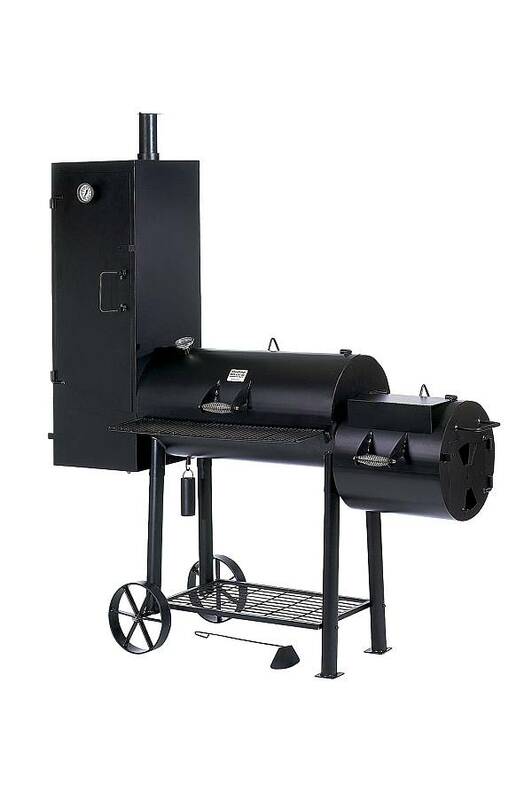 If you need a very large, versatile smoker/grill combo for the backyard or pool area, then the Medina River Big Daddy Double Bar B Q Smoker is definitely for you. Fire Box: 17" x 17"
Horizontal Smoking Chamber: 36" x 17"
Vertical Smoking Chamber: 48" x 16"
Dimensions: 81" x 34" x 78"